The drive from Niagara on Lake to Guelph was about an hour and 45 minutes and went by really quickly as we were all excited to see Karla, Bruce, Brittany and Kyle. We arrived at about half past five in the evening and only Karla was at the house at the time , the rest of the family was to arrive shortly. Karla had also organised the extended families arrival for a party and to meet us. We were chatting catching up on things as we hadn’t seen her in like 4 years. She said that our meal at Outback was actually quite reasonable as they were entrees – this was interesting as it was quite a lot more expensive than the USA. Brittany was the first to arrive, we sat on the couch and had a beer and chatted. 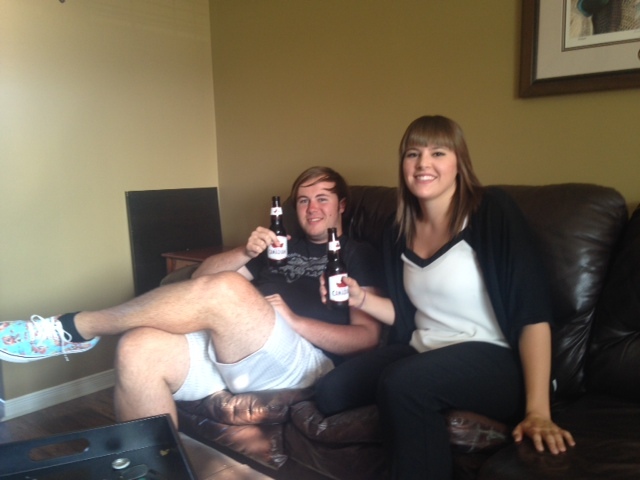 As the drinking age is 19 here in Canada, it was great having a ‘legal’ beer for a change! Then Bruce arrived with the pizza – the best pizza we have had since back home hands down. We were meant to be celebrating Kyle’s birthday but he had organised to go play golf with his mates, but then ended up cancelling that too and joined us. Then the extended family arrived, really welcoming people and it was great to meet them all. Karla asked us if Cameron and I had had S’mores or Poutine before. Smores are chocolate and marshmallow filled graham crackers that you toast over a fire. And Poutine, which is only found in Canada is chips covered in gravy and cheese curds. Now because we hadn’t had it or even seen it, the girls decided to drive Cam and I to go get some Poutine. It was amazing, very simple, but tasty. We went back to the house where the rest of the family were, ate the Poutine. Kyle was back at this point, and we went to go play on his xBox. After that everyone went home, we went to bed as we were traveling to the boat tomorrow. That will be in the next post.